After being trapped inside his own body, unable to communicate with anyone but his own thoughts, Andy Rosetti finally wakes up from the coma that controlled his life for one month. But upon awakening, Andy finds himself and his friends in an unfamiliar setting: a mansion riddled with secrets and supernatural forces. As his friends fall prey to the entities encompassing them, Andy must figure out if the darkness lies within the mansion's walls or within the people surrounding him. Stacy A. Padula, a Massachusetts native, is the director of operations at JBG Educational Group, a company that works closely with young adults and their families. She mentors and guides students through academic, social, and emotional hardships. She wrote The Forces Within to "open the eyes of teenagers to see the truth about the forces that are at work inside and around them." 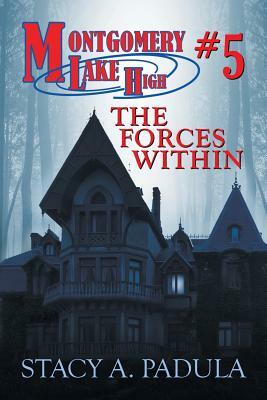 Montgomery Lake High #5: The Forces Within by Padula, Stacy A. was published by Strategic Book Publishing & Rights Agency, LL in March 2014. The ISBN for Montgomery Lake High #5: The Forces Within is 9781628578966. Be the first to review Montgomery Lake High #5: The Forces Within! Got a question? No problem! Just click here to ask us about Montgomery Lake High #5: The Forces Within. Author / Artist Padula, Stacy A.